Education in my sense of liberating and strengthening (making articulate and uncompromising) the intellect is of course antithetical to much of what is going on in our schools and universities, which I would rather refer to by such terms as training, molding, socialization, mystification, memorizing of facts, obfuscation of meaning–all processes designed to produce intelligent citizens who are ready to execute jobs faithfully and not ask any questions about their meaning or purpose or value to fellow human beings. Corporate society takes care of everything. And all it asks of anyone, all it’s ever asked of anyone ever, is not to interfere with management decisions. As a professor and lifelong learner, I see education as equal parts empowering and enlightening. Knowledge is power, as Francis Bacon said, and the lamp of learning helps to illuminate our lives. But is education also about social control? Sadly, the answer is “yes.” Education that is simplified and standardized is often little more than indoctrination. Education that is too regimented, too centralized, too much like a factory, prepares students for a life of unquestioning obedience and unreflective conformity. There have been very direct, coordinated battles [against knowledge and reformers] – witness the censorship battles over Tom Paine’s ‘The Rights of Man’, when you could go to gaol for simply owning a copy, and the 19th Century ‘Church and King’ mobs sent to punish radical writers and publishers by burning down their houses … There are powerful social forces at work that have their self-interest at heart and see what they do in that context. Witness the great educator of the working class, Hannah Moore, writing to her Bishop at the turn of the 18th Century, assuring him whilst she was teaching these working class girls to read, sufficient for their service duties, they would never learn to write, for that would encourage them to aspire beyond their station. Education today still largely teaches students to stay within their station. Today’s focus on vocational education is both salutary and one-dimensional. Students are told to get degrees as passports to a job. They’re not told to aspire to be skeptical citizens who dare to question (or even to supplant) authority. And there’s the rub. We face difficult, seemingly intractable, problems in the world today. Global warming. Fossil fuel dependence. A widening gap between rich and poor. A military-industrial-intelligence complex that dominates our foreign policy as well as much of our domestic policy. Worrisome budget deficits. Unaffordable health care. The list goes on. But our students are not being educated to address these challenges, at least not in any radical way, in the sense of getting to the roots of the problem. Education, in essence, has largely become training, just another form of careerism. And the high student debt that many students incur in obtaining their “passport to success” ensures they are essentially indentured servants, forced to keep working to pay off their debt (and often to keep their health care benefits as well). Just as college football is a feeder to the NFL, higher education is increasingly a feeder to business and industry. 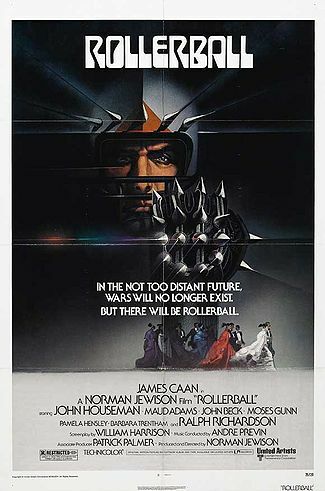 It’s a Rollerball world dominated by violent sports and corporate conglomerates. Education, in short, has lost any sense of higher purpose. “Adapt to the world as you find it” is both the implicit and explicit message. And whatever you do, don’t rock the boat. Part of the method is to destroy any sense of class identity among students. Today, virtually all my students self-identify as being members of the “middle class,” even though many are working class (just as I am a son of factory workers). In American society, we’ve lumped blue-collar with white-collar jobs, so that now janitors and fast-food workers (for example) think of themselves as middle class. This is not to denigrate janitors or fast-food workers. Rather, it’s to highlight the calculated decline of class identity and solidarity in the U.S. If we’re all middle class, if we’re all bourgeois, why bother uniting in unions to fight for our rights? If we allegedly inhabit a post-class society of social mobility, education can then ignore ethical and societal questions of fairness to focus on workforce training and professional development. Put differently, you can’t see you’re being screwed as a worker when you view yourself as an “owner” in your own right. And when you’re educated to conform, to produce the standard answer, to aspire to a respectable job (with your identity confined to that job), your consciousness will never be raised to challenge the system in any radical way. In fact, your goal is to become the system, to reap its rewards for yourself, just as those that you now work for have done and are doing. As we witness uprisings around the world, from Egypt to Greece to Brazil and elsewhere, we should ponder why there are not similar uprisings in the U.S. Is it because the U.S. really is, pardoning Voltaire, the best of all possible worlds? Or is it because our educational system immunizes us against any form of “socialism” (a curse word in American politics) or class consciousness? Education, when it’s about getting the right answer that leads to the right job without ever questioning prevailing authority, becomes a status quo operation in social control. To recognize that is not to surrender to it. Rather, it’s to begin to fight it. Without the least doubt, Capitalism’s great triumph in US society has been the virtual obliteration of class consciousness. I must say, though, I find it hard to believe the folks slaving at my local Mickey D’s have gone over to the “Oh, I’m middle class” camp!! The question is ‘how much is too much?’. I was raised at a time ( pre WWII ) when pupils were silent except when asked and teachers were expected to exert firm discipline. Is that inconsistent with learning? There again the question is how much discipline is too much. Real learning requires the learner to continue to question, study, and take the time and effort to evaluate rather than go for the first and easy answer. That requires self discipline and the training to study rather than to accept the immediate answer. If one is not afflicted at birth with ‘genius’ genes, most people acquire self discipline from the discipline they get from their parents and societal experiences like school. Unfortunately large segments of our society have been deprived of this ‘imposed’ discipline by their schools and the marginal lives our society has imposed on their parents. Professor Astore is correct in bringing attention to the dismal level our government has allowed and encouraged our great public school system to deteriorate so that we have citizens who have neither the tools nor capability to think a problem through. How embarrassing that our once great country has a population where about one out of five or six citizens think the world is only 6000 years old. Dude your article is awesome, I am just the kind of student you described there. I’m too afraid to go against the system and find myself; not sure what the future has in store for me. While I sit in my room spending continuous hours and days (because my university says I should be spending 30 hours every week per course I take to study) I can’t find the time to do something about this world, to actually learn, find the real reason I’m here. It’s like I’m not good enough for them you know? I’m not the student that gets perfect marks, I don’t know if I’ll ever be, but the question is, am I really worth sacrificing just to get a few numbers on my GPA? Why does everyone have to be this ‘model student’ when we are all unique and all of us offer something different to this world! Stumbled upon this truly brilliant essay, and just had to share it. ” …the intellect is of course antithetical to much of what is going on in our schools and universities.” Insightful analysis. Critical thinking skills are unnecessary for atomized units. Part of the combine and conquer strategy was accomplished in the 1970s with the re-branding of the working class as the middle class. It is rare to find even progressives these days (many of whom, it seems, are just tepid liberals who seek to escape the fact that rabid-cons have made the term “liberal” an epithet) who can bring themselves to utter the term “working class”. And with that re-branding, the GOP welcomed the “blue-collar middle class” into the fold, while the DEMs just ignored them and concentrated on issues of relevance to the genuine professional middle class. Along the way, the military scoops up the teenagers of the working class and brutally performs its magic on their gullible, unformed sensibilities and creates an identity-for-life (soldier>veteran) and an affiliation with the GOP as the party that looks out for their interests, and the militarized authoritarian perspective is reproduced on an on-going basis. It pains me to constantly see people who should know better referring to people who are clearly working class as middle class, as if there is something stigmatic about being working class; the implied denigration of the working class not being lost on its members. And there goes any strength that might be gained from a genuine class consciousness, melded into a wannabe middle class category that dilutes appreciation of our real position relative to status and power.